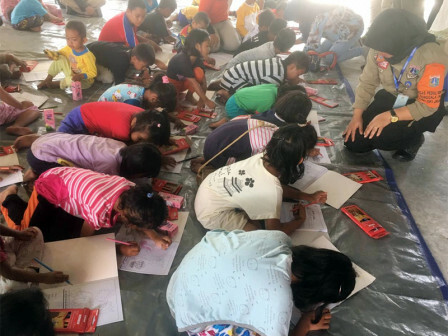 Jakarta Response Team gives trauma healing by conducting coloring session for tens children of Palu victims at Al-Khairaat Islamic University in Palu.
" We hope they can be more easily to approach children"
Previously, Jakarta Fire Handling and Rescue (Gulkarmat) Dept. 's Unit Commandant, Sunaryo who are also a part of Jakarta Response Team got information from Palun Nopi (60), a resident, about refugee camp in that university. Then, this information was reported to Jakarta Disaster Unit Commandant, Salman Ansori. After surveying the refugee camp location, Jakarta Response Team deployed trauma healing team consist of Satpol PP, Jakarta BPBD, and Jakarta Bazis yesterday's morning. "Team personnel mostly are women. We hope they can be more easily to approach children," Nopi said, Monday (10/15). He mentioned, his side has known some of Jakarta Gulkarmat Dept. personnel before retired as Palu Gulkarmat Dept. personnel. "Thus, I immediately coordinated when there was a disaster," he conveyed. According to him, these refugees are mostly came from Lere Urban Village, Palu Barat Sub-district who live beside Palu's Jembatan Kuning. "True, there are many children in the shelter that can be involved in activity. They choose this location because it is quite high and far from sea," he added. Al-Khairaat Islamic University's Vice Chancellor II, Muhammad Yasin explained, his side has listed 50-60 families or more than 100 people who evacuate to the university. "On the other hand, campus activities are already running as usual. Thus we need to avoid conflict between students and refugees regarding needs of toilet, parking area, and others," he mentioned. Besides coloring session, Jakarta Response Team also encourage children to play tepuk semangat game and blocks building game.